At July’s High-level Political Forum in New York, a central part of the discussions on achieving and monitoring SDG 6 (clean water and sanitation) was the importance of looking at water quality in a broader context. One example is looking at the quality of freshwater in the context of other sectors, in relationship to food security, or the impact on other resources such as soil. This topic was also high on the agenda at World Water Week in Stockholm, Sweden in August. Seeing freshwater quality in a broader context is no doubt important, but what we often forget is that implementing this broader view comes with significant measurement challenges. At the forefront of these challenges is the difficulty of identifying relevant data and information needs in view of multiple goals, meeting these data and information needs, and interpreting data and information. These challenges involve various interests and require negotiations. In other words, addressing them is a political matter. To meet such challenges, water quality measurement must move beyond being a technical issue addressed by natural scientists alone, and become a topic for inter- and transdisciplinary research teams. Let us first have a look at what has to be measured. If we consider multiple goals when measuring water quality, this complicates the process of identifying data and information needs. Before measurement programmes can be set up, the management goal needs to be clear — for example, using water in agriculture for energy and/or food production. This is often not the case due to a lack of regulations specifying integrated measurement goals (such as for soil and water management). Developing such regulations requires negotiation processes laden with transaction costs for all relevant actors. 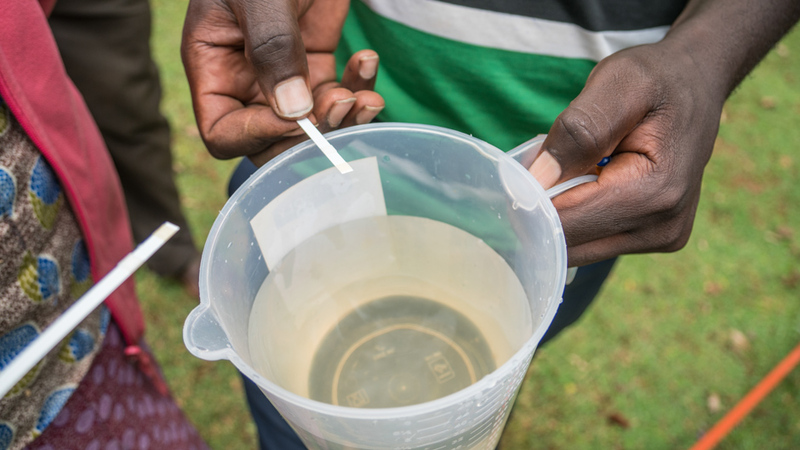 Further, even if the goals are clarified, it often remains unclear what types of indicators, data, and standards are best suited to efficiently monitor progress in achieving a goal (for instance standards for health-related water quality or lower standards). This leads to the question of whether existing indicators can be used or if combined indicators are needed. Let us assume now we know what has to be measured. The next question would be how we can obtain the relevant data and information. We see here a couple of challenges for meeting these needs. First, one needs many different types of data and information, such as data on the quality of waters, soils, agricultural yields, and human health. Second, such data needs are particularly challenging to meet from the technical point of view, given the high complexity of the social-ecological system. Take, for instance, the impact of fertilizers on the amount of nitrogen in groundwater. This impact depends on various factors such as weather conditions, the cultivated plants, or soil characteristics. Such complexity can lead to unforeseen or delayed effects, which complicate measurement programmes even further. Third, even if data are available, information transfer has particularly high requirements, since data are typically dispersed across research groups (e.g. soil and water scientists) and public authorities (e.g. water and agricultural authorities). Sharing data between these entities can be challenging as there is often a lack of communication or trust, or asymmetric power and interests are involved. All this ultimately hinders the establishment of sufficient and inclusive databases. Let us assume for a moment we can overcome these challenges and have our data at hand. A third challenge then regards their use for a truly integrated assessment of solutions. We assume here that it will be particularly challenging to interpret data and information given multiple baselines of partly conflicting goals. Take, for instance, measuring the amount of nitrogen in soils and water. High amounts of nitrogen can be interpreted in various ways. From a water quality perspective, high amounts are problematic since they lead to the eutrophication of waters; from an agricultural perspective, however, it may also indicate a high production level, leading to economic growth and food security. Understanding such relations requires thinking in new, broader systems that may go beyond traditional check lists of good practices. While seeing freshwater quality in a broader context seems to be good idea for achieving truly sustainable development, we have to be prepared for increased challenges in the measurement process. These challenges are not only technical, but also political, meaning that they involve political discourses among various stakeholders, reflecting various interests and power asymmetries. New tools based on rigorous research need to be developed to help practitioners overcome such political challenges. At the UN University Institute for Integrated Management of Material Fluxes and of Resources (UNU-FLORES), we believe that measurement-related activities should be conducted in a participatory manner from the very start. First, an interdisciplinary research agenda on water quality measurement is the way forward. Measuring water quality has mainly been understood as a natural science endeavor. However, addressing the politics in defining targets, gathering data, and interpreting data calls for the involvement of social scientists. Take, for instance, the question of data sharing. Extensive and successful research conducted by political scientists on the conditions of information sharing in conflict-laden environments can help design water measurement programmes in the face of complex societal goals. The second step is to deepen existing stakeholder engagement by opening the natural science-dominated field of measurement to the broad range of stakeholders in resource management. Practitioners can be involved here in setting the frame for measurement. (Natural) scientists have to refer to these societal needs when setting up measurement programmes within their research programmes. This can be done, for instance, by discussing measurement challenges together with stakeholders of different ministries in joint workshops. This article was first published on the International Institute for Sustainable Development SDG Knowledge Hub. Sabrina Kirschke is a Research Assistant with the Water Resource Management unit at the UNU Institute for Integrated Management of Material Fluxes and of Resources.